But this isn’t to say that those are places where a person living for Christ can’t be fed. Just like my church isn’t the only place in the world where Christ dwells, I’m sure He can dwell in the mega-ministry as well. I just feel as if people often get “lost in the sauce”. Part of what makes me a bit more accountable is the fact that there aren’t quite so many people to hide behind. It’s quite possible on any given Sunday (no pun intended) that I can be called upon to do something. Church, to me, is at its strongest when people are intermingling with other believers who they wouldn’t normally associate with. It’s about getting to fellowship and stand on common ground with others who share your faith as well as sharing your experiences and being a beacon of light to draw others to Christ. One day, for some strange spirit-led reason, I was moved to download a podcast from Joel Osteen’s ministry. I was blown away. Tears did well up in my eyes that day. He spoke to my spirit. And since that one day that I listened to him, he has been speaking to my spirit. No, he hasn’t replaced my pastor. Not by a long shot. And I don’t intend to join his fellowship. 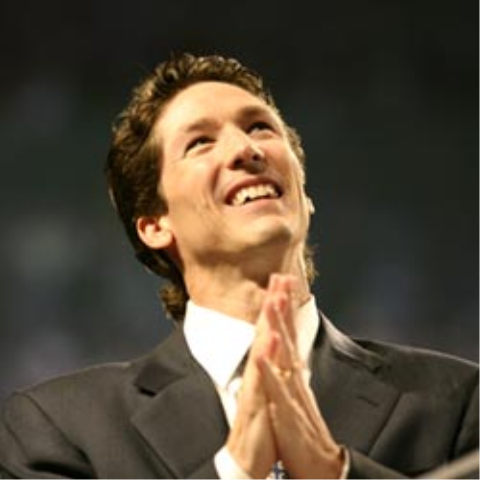 But I do feel that Joel Osteen has a tremendous gift from God that is to be appreciated. There are a few things that I like about Joel. His spirit reminds me of my own. He’s not insinuating that sin is o.k. and that Satan and temptation aren’t real. But he chooses to use his gift to do what God has called him to do — to inspire. I listened to Joel’s podcast that day with the intention of saying, “yup — been there, done that. It’s just like all the rest.” But it isn’t. He has a special ministry and I know that he’s helping people. I don’t pretend to not worry that Joel’s message might not be fully covering all that Christians need to know. I don’t hear him quote scripture very often. I didn’t see very many people with bibles in the 60 Minutes piece. And I don’t even hear him draw that often upon some of the tough lessons that my pastor has helped me to understand. But to those that criticize him for it, I say, be careful. For one, I never like to talk about anybody’s spritual leader. If that is the person that God has sent into your life to coach you and to help you, then who am I to talk about them. But more importantly, everyone is going through change — constant change. We’re changing every day. I’m not the same person I was five years ago and I know that Joel is still learning in his still young, but thriving ministry. In that 60 Minutes piece I saw a somewhat one-sided, spiritually void take on what it is that he does. If I saw the story without having listened to any of his sermons, I would certainly have probably never listened. You saw lots of money being put in buckets and the extravagant stadium where they hold service. It had all the makings of a “look at this crook” type story. But the thing that those who know Joel from listening to him humbly share his story with us and do his best to use the Gospel to inspire us saw a man who admitted that he doesn’t have all the answers. A man who is trying to stay within his gifting. One incredible message that Joel shared one day (and I think it quite beautifully sums up his response to the negativity that has been brought against him) was a story about one of his singers that do the worship and praise part of the service before he speaks. He spoke about this singer and how beautifully he sounded and how wonderfully he hit every note and, jokingly, said to us, “I thought, now God, that’s not fair.” (Joel mentioned that he doesn’t sing.) But then he talked about the fact that this gentleman had different than he did. Joel was called to inspire and to lift up. This other guy was called to sing. Some are gifted in their ability to play an instrument. Or gifted in their ability to care for the sick. In short, Joel has often said that he doesn’t have all the answers. But I have to believe that even if it was a smaller church with a smaller flock, Joel would still be preaching his message of hope. For Joel’s critics, I ask you to do one thing…. reflect on whether or not more souls have been brought to Christ by Joel’s messages. Have any been saved by Joel’s efforts? Are there people walking more like Christ now because of the words of encouragement that he shares? No, the ends don’t justify the means, but I think there’s more substance to Joel’s message that many, who’ve only listened to him for soundbytes at a time, are aware of. At one point during the interview, Joel broke down and cried when he reflected on all of the ways that he’s known that God has used him to make the lives of others better. I believe in my heart that his tears were almost his way of expressing pain at the way that his message of hope is being misconstrewed as the message of one who wants to “tickle the spirit”. I love my brothers and sisters in Christ. I just feel that we need to be more open to the ways that God wants us to bring Jesus to others. So often we try conventional means of drawing souls to Christ and we get the same results — people who already know who Jesus is and who aren’t uncomfortable in what we’ve come to know as the “traditional church”. We’re taught that church is not the building/dwelling but the people and their spirit. So why are we knocking people who are thinking outside of the box and using their God-given gifts to try and bring God’s message of hope to more people. I agree — this is the starting point. Hopefully it leads to people having an unquenchable desire to learn about Christ and to want to be more like Him. But the negativity bothers me. I don’t pretend to know everything about Joel Osteen. I’ve never met the man. I don’t know about anything other than the words of encouragement and faith that he speaks. If there are those who find fault with his actions, Christ teaches us to pray for him. Pray that his ship might be righted. Pray that he might become the full realization of what God wants him to be. When I reflect on those who come against Joel, I am reminded Ozzie Davis’ words eulogizing Malcolm X…. I came across this link on a Christian blog that I visit (www.thinkchristian.net). I don’t know Mike Yaconelli. And I never had the chance to greet him or to even hear him prior to his death. But I do know that he tapped into that spirit of wanting to use unconventional means to reach out to people who don’t respond to conventional evangelism. Like Joel Osteen, this inspired me, and I wanted to share it…. I would definitely say, by your definition of “brought to Christ”, that Joel Osteen is doing amazing things for God. But I believe by God’s definition of such, he may not be. Is he making disciples or casual Christians to which the Lord may say, “I never knew you”? The former deny themselves, take up their cross (an instrument of suffering), and follow him in obedience. The latter are consumed with their own lives. Is he teaching people to do that or is he teaching people to feel good about themselves? Sir, to teach of a Christ who doesn’t fit the entirety of Scripture is called false teaching. Scripture tends to constantly warn us against false doctrine (no matter how good it sounds). I thought your opinions were well thought-out, well-stated and balanced. Thanks.